What is the Eucharist, anyway? Well, Eucharist is a Greek word that means “Thanksgiving”. It refers to the Body, Blood, Soul, and Divinity of Jesus truly present in Holy Communion. What was once an ordinary piece of bread and an ordinary cup of wine, has now been changed (transubstantiated) into Jesus. In other words, just like Jesus changed the substance of water into wine at Cana, the priest, through the power of Jesus given to him at his ordination, changes the substances of bread and wine into the Body and Blood of Jesus at the consecration. So what are some of the biblical references to this? Well, starting in Genesis 14:18, Melchizidek, the High Priest, offers bread and wine as sacrifice. The Bible says in Hebrews 7:17 that Jesus is priest forever, in the line of Melchizidek. Melchizidek is a biblical type (foreshadowing) of Jesus. A biblical type is an OT person or event that prefigures a person or event in the New Testament. Jesus offered Himself at the Last Supper in the form of bread and wine, so He is both priest and victim. It's also important to remember that just as Adam and Eve allowed sin to enter the world by physically eating the forbidden fruit from the tree of knowledge of good and evil, Mary gives us the fruit of the cross aka the Tree of Life, which is the body, blood, soul, and divinity of Jesus Christ in the Eucharist for us to physically eat, thus overcoming sin and allowing our salvation. The devil goes around as a roaring lion seeking to devour us; Jesus, on the other hand, goes around like the Lamb of God seeking for us to devour His flesh to overcome the devil. The LORD said to Moses, "Command the people of Israel to bring you pure oil from beaten olives for the lamp, that A LIGHT MAY BE KEPT BURNING CONTINUALLY. Outside the veil of the testimony, in the tent of meeting, Aaron shall keep it in order from evening to morning before the LORD continually; it shall be a statute FOREVER throughout your generations. He shall keep the lamps in order upon the lampstand of pure gold before the LORD continually. "And you shall take FINE FLOUR, and bake twelve cakes of it; two tenths of an ephah shall be in each cake. And you shall set them in two rows, six in a row, upon the table of pure gold. And you shall put pure frankINCENSE with each row, that it may go with the BREAD as a memorial portion to be offered by fire to the LORD. EVERY SABBATH day Aaron shall set it in order before the LORD continually on behalf of the people of Israel as A COVENANT FOREVER. In the Catholic Church, there is a lamp that burns continually near the tabernacle where the Eucharist is kept, behind a veil, in a golden tabernacle. During the Mass on the Lord's Day, it is placed on the altar, or table for sacrifice, with incense. And according to Jesus in Luke 22:19-20, the bread that is now become his body (his real PRESENCE) and the wine that is now become His blood is to be a memorial sacrificial meal for the New Covenant that also forgives sins. There are LOTS of parallels here between the Bread of the Presence and the Eucharist. When Elijah was fleeing from Jezebel, he ate cake from heaven, and was able to survive for 40 days and 40 nights on it. And that is definitely a huge hint that those of us who eat bread from heaven at Mass have strength for the journey! 1 Kings 19:5-8: And he lay down and slept under a broom tree; and behold, an angel touched him, and said to him, "Arise and eat." And he looked, and behold, there was at his head a cake baked on hot stones and a jar of water. And he ate and drank, and lay down again. And the angel of the LORD came again a second time, and touched him, and said, "Arise and eat, else the journey will be too great for you." And he arose, and ate and drank, and went in the strength of that food forty days and forty nights to Horeb the mount of God. Another Old Testament type is the Passover. In Exodus 12:7-8, God told Moses to mark the doors of the Jewish homes with the blood of the slain lamb, using a hyssop branch, and to eat the lamb, with bitter herbs, as well, so that they and their children could live, before finally leaving Egypt for the Promised Land. Just so, we are commanded by Jesus, the slain Lamb of the New Testament, to eat His body and to drink His blood, so that we can live forever in the real Promised Land, Heaven. Jesus was given bitter vinegar to drink during the crucifixion, with a hyssop branch. In Christianity, the Eucharist at Mass has replaced the Jewish Passover meal. The Church is now the new Israel. In none of the gospel narratives is an ovine passover lamb mentioned during the Last Supper. Why? Because Jesus is the Passover Lamb for all time. A lot of non-Catholics say that the Eucharist is only a symbol of Jesus, but no Jewish Passover would have been a real Jewish Passover unless the REAL Passover Lamb was eaten. That means that the bread and wine the apostles ate at the Last Supper had to be the REAL Passover Lamb, or Jesus. And the bread and wine we now consume at Mass is now the same Eucharist, or Jesus. Another prefigurement of the Eucharist in the Old Testament is the manna from Heaven. In Exodus 16:4ff, God feeds the Israelites struggling in the desert with bread from Heaven. The Israelites were forbidden from storing more than one day’s supply of the manna (except for the day before the Sabbath), so that they would learn to trust in God’s providence. Just so, Jesus feeds us with the bread of heaven, His body and Blood, while we struggle in our lives, which can certainly resemble wandering in a desert at times. When we say the “Our Father” prayer – “Give us this day our daily bread”- we are asking God to give us the Eucharist daily, just like God gave the Jews in the desert their manna daily. Paul calls manna in the Old Testament "supernatural food" in 1 Corinthians 10:3, and how much more supernatural the Eucharist is, since all Old Testament types are imperfect and point to the perfect (Jesus) in the New Testament! Even the birth of Jesus in Bethlehem points to the reality of His Body being the bread of life come down from heaven. Why? Because the name "Bethlehem" is a Jewish word that means "House of Bread." And after Jesus was born, Mary placed him in a manger, which is a feeding trough for sheep to come and eat out of! In 1 Corinthians 15:45, Jesus is described as “the new Adam”, meaning that through Adam sin entered the world, and through Jesus salvation entered the world. However, there is more to it than that. Adam ate from the tree of knowledge of good and evil, and died as a result. Conversely, Jesus was hanged on a tree (Acts 10:39); He commanded us to eat of the fruit of this tree (his Eucharistic flesh) at the Last Supper, so that we will live forever and never die. In the New Testament, there are also several types of the Eucharist. At the wedding feast at Cana, in John 2, Jesus changes ordinary water into wine. Jesus describes himself as the bridegroom of the Church in Luke 5:34-35. It is no coincidence that His first public miracle took place at a wedding, where He changed one substance into another, thus prefiguring the transubstantiation of the wine into blood at the Last Supper. This is a prefigurement of the heavenly marriage supper of the Lamb, as told to us in Revelation 19:9. Catholics eat with Jesus (sharing a meal together in fellowship is very Jewish!) at every Mass! Revelation 2:17 says that to him who conquers, Jesus will give him some of the "hidden manna." What is hidden manna? Manna is a Jewish term for "What's that?" The Jews didn't know what the white stuff on the ground was in the desert, and so they asked each other "What's that? ", or "Manna?" But Revelation is very New Testament, and there is no more Old Testament Manna anymore. But for sure, there is the New Testament Eucharist, which does not look any different than a regular piece of bread - therefore, it can be described as "hidden manna. "The Eucharist IS Jesus, who also didn't look any different from a regular man, and therefore his Godliness was "hidden" from the sight of man. The Pharisees never would have done to Jesus what they did if they could have seen who He really was. Similarly, Protestants and atheists who badmouth Catholics for believing in the Real Presence of Jesus in the Eucharist are guilty of profaning the body and blood of Jesus, hidden in the Eucharist. Why? Because they walk by sight, not by faith, whereas Catholics walk by faith, not by sight when it comes to the Eucharist (2 Corinthians 5:7). Another example is the multiplication of the loaves, in John 6:11, where 5000 people were fed with only 5 barley loaves. Just as thousands were filled with just five loaves, Jesus feeds millions of believers throughout the centuries with his Eucharistic flesh. In the Old Testament, Exodus 24:8, Moses sealed the Covenant by sprinkling the Israelites with REAL BLOOD, not symbolic blood, and Jesus also sealed the New Covenant with REAL BLOOD, not symbolic blood. Jesus goes to great lengths to tell his believers about the Eucharist. He mentions both the manna in the desert and the multiplication of the loaves as bread that only provided for temporal needs. He then explained that His body and blood was "real food", & would give us eternal life, not just fill our stomachs. The Jews who heard him said that it was a “hard saying”, and walked away. Why would they walk away and leave someone who they had seen raise the dead, multiply the loaves, cure the sick, walk on water, etc., if “eating his body” and “drinking his blood” was only a symbolic statement? They understood his meaning perfectly, that it was a literal statement, and not symbolic. To literally “eat someone’s flesh” and to “drink someone’s blood” was a pejorative term in those days, as seen in Isaiah 9:20, Jeremiah 46:10, and Deuteronomy 32:42. We know from Mark 4:34 that Jesus always explained his parables to his disciples, but here he did not explain anything. Why? Because John 6 is NOT a parable, but is telling us all about how He will give us His REAL FLESH TO EAT! John 6: 30-66: So they said to him, "Then what sign do you do, that we may see, and believe you? What work do you perform? Our fathers ate the manna in the wilderness; as it is written, `He gave them bread from heaven to eat.'" Jesus then said to them, "Truly, truly, I say to you, it was not Moses who gave you the bread from heaven; my Father gives you the true bread from heaven. 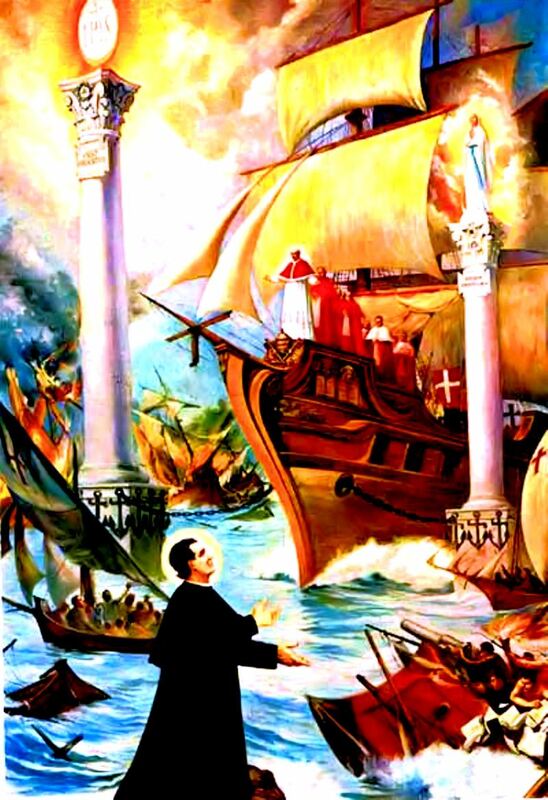 For the bread of God is that which comes down from heaven, and gives life to the world." They said to him, "Lord, give us this bread always." Jesus said to them, "I AM the bread of life; he who comes to me shall not hunger, and he who believes in me shall never thirst. But I said to you that you have seen me and yet do not believe. All that the Father gives me will come to me; and him who comes to me I will not cast out. For I have come down from heaven, not to do my own will, but the will of him who sent me; and this is the will of him who sent me, that I should lose nothing of all that he has given me, but raise it up at the last day. For this is the will of my Father, that every one who sees the Son and believes in him should have eternal life; and I will raise him up at the last day." The Jews then murmured at him, because he said, "I am the bread which came down from heaven." They said, "Is not this Jesus, the son of Joseph, whose father and mother we know? How does he now say, `I have come down from heaven'?" Jesus answered them, "Do not murmur among yourselves. No one can come to me unless the Father who sent me draws him; and I will raise him up at the last day. It is written in the prophets, `And they shall all be taught by God.' Every one who has heard and learned from the Father comes to me. Not that any one has seen the Father except him who is from God; he has seen the Father. Truly, truly, I say to you, he who believes has eternal life. I AM the bread of life. Your fathers ate the manna in the wilderness, and they died. This is the bread which comes down from heaven, that a man may eat of it and not die. I AM the living bread which came down from heaven; if any one eats of this bread, he will live for ever; and the bread which I shall give for the life of the world is my flesh." The Jews then disputed among themselves, saying, "How can this man give us his flesh to eat?" So Jesus said to them, "Truly, truly, I say to you, unless you eat the flesh of the Son of man and drink his blood, you have no life in you; he who eats my flesh and drinks my blood has eternal life, and I will raise him up at the last day. For my flesh is food indeed, and my blood is drink indeed. He who eats my flesh and drinks my blood abides in me, and I in him. As the living Father sent me, and I live because of the Father, so he who eats me will live because of me. This is the bread which came down from heaven, not such as the fathers ate and died; he who eats this bread will live for ever." This he said in the synagogue, as he taught at Capernaum. Many of his disciples, when they heard it, said, "This is a hard saying; who can listen to it?" But Jesus, knowing in himself that his disciples murmured at it, said to them, "Do you take offense at this? Then what if you were to see the Son of man ascending where he was before? It is the spirit that gives life, the flesh is of no avail; the words that I have spoken to you are spirit and life. But there are some of you that do not believe." For Jesus knew from the first who those were that did not believe, and who it was that would betray him. And he said, "This is why I told you that no one can come to me unless it is granted him by the Father." After this many of his disciples drew back and no longer went about with him. Some people take John 6:63 as the scripture that negates everything that Jesus just said, because it says “the flesh is of no avail”. But scripture can’t contradict scripture, no matter how hard it is twisted out of context. John 6:63 talks about “the” flesh, or human flesh in general. In the rest of John 6, Jesus always refers to the necessity of eating “my” flesh, which is quite a distinction. To say that the real meaning of the above scriptures is that "Jesus flesh is useless", as some protestants do, is heresy. We are saved by the flesh of Christ sacrificed on the cross. And the rest of John 6:63 talks about his words being spirit and life. “Spirit” is not symbolic, as in “The Father, Son, and Holy “Symbolic”. The Spirit is just as real as He can be. In other parables that Jesus told, when there was a question as to the meaning of it, he very carefully explained it, as is the case of the sower and the seed (Luke 8:11). However, here, he explains nothing; he just turns to his twelve apostles and asks if they also want to leave him. Why? Because He meant it literally, not figuratively. There really was nothing to explain! 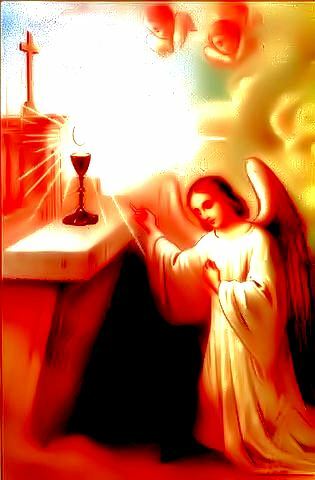 The cup of blessing which we bless, is it not a participation in the blood of Christ? The bread which we break, is it not a participation in the body of Christ? Because there is one bread, we who are many are one body, for we all partake of the one bread. Consider the people of Israel; are not those who eat the sacrifices partners in the altar? What do I imply then? That food offered to idols is anything, or that an idol is anything? No, I imply that what pagans sacrifice they offer to demons and not to God. I do not want you to be partners with demons. You cannot drink the cup of the Lord and the cup of demons. You cannot partake of the table of the Lord and the table of demons. Here Paul talks about participating in the body and blood of Christ by receiving Holy Communion. This brings up an important point. The sacrifice of the Mass is not another sacrifice of Jesus; it is the same one repeated over and over again, through space and time. The key word is SACRIFICE, as in "This is my body...which is poured out for many for the forgiveness of sins." Verse 18 above mentions the Jews eating the sacrifice of the altar being partners. Of course, the old animal sacrifices of the altar have now been replaced by the one pure sacrifice of the altar, Jesus Christ, as foretold in Malachi 1:11. So many people just think of Communion as a memorial only, but it is much more than just a memorial. It is the unbloody sacrifice of Calvary. Additionally, in verse 21 above, Paul talks about not partaking of the table of demons AND the table of the Lord. That is why the Church says that one must go to confession first and be absolved of any mortal sins before receiving Holy Communion. For I received from the Lord what I also delivered to you, that the Lord Jesus on the night when he was betrayed took bread, and when he had given thanks, he broke it, and said, "This is my body which is for you. Do this in remembrance of me." In the same way also the cup, after supper, saying, "This cup is the new covenant in my blood. Do this, as often as you drink it, in remembrance of me." For as often as you eat this bread and drink the cup, you proclaim the Lord's death until he comes. 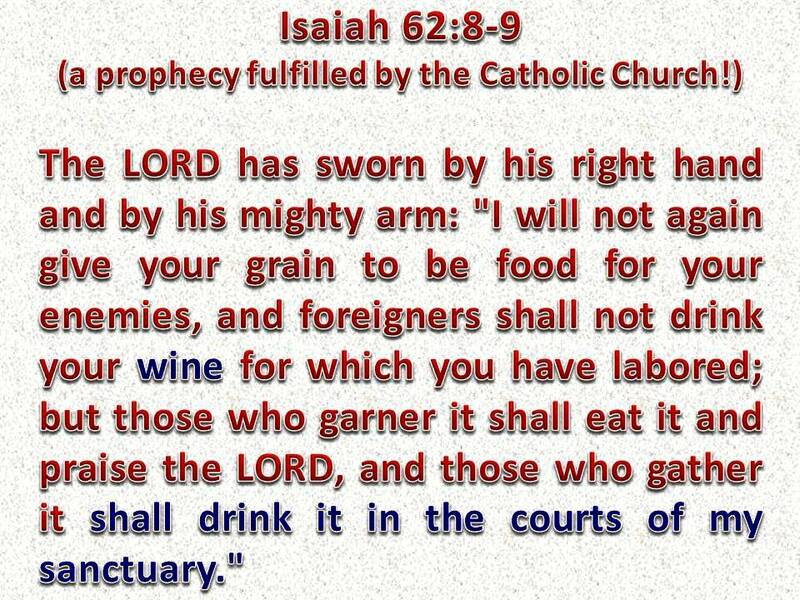 Whoever, therefore, eats the bread or drinks the cup of the Lord in an unworthy manner will be guilty of profaning the body and blood of the Lord. Let a man examine himself, and so eat of the bread and drink of the cup. For any one who eats and drinks without discerning the body eats and drinks judgment upon himself. That is why many of you are weak and ill, and some have died. How can one profane the body and the blood of the Lord if the Eucharist is only a symbol? People can get sick and die if they do not discern the body of the Lord when they consume the Eucharist. They actually eat and drink judgment upon themselves. How can this be if it is only a symbol? In Acts Luke 24, on the road to Emmaus, the resurrected Jesus appears to some disciples, but his identity is "hidden" from them. Then He discusses the scriptures that pertain to Him (the Liturgy of the Word), and then sits down to table and celebrates the breaking of the bread (the Liturgy of the Eucharist) with his disciples. At the moment of Consecration, the true identity of Jesus is made known to His disciples, and then he disappears (becomes "hidden"). So we see here that the Last Supper is misnamed, because in reality, the Last Supper was the First Eucharist, and at Emmaus one of the first things Jesus did was to celebrate Mass AGAIN with the Liturgy of the Word and the Liturgy of the Eucharist, the 2 components of the Holy Mass! And the term "hidden manna" is now apparent as to its meaning - Jesus is "hidden", or truly present, in the Bread from Heaven! 7. It is a pledge of eternal life. The bottom line is that Jesus Himself commanded us to eat His body and to drink His blood, so that we can have eternal life. By ignoring this command of Jesus, or by downplaying its significance, we are putting our very souls at risk, not to mention the fate of the entire world. 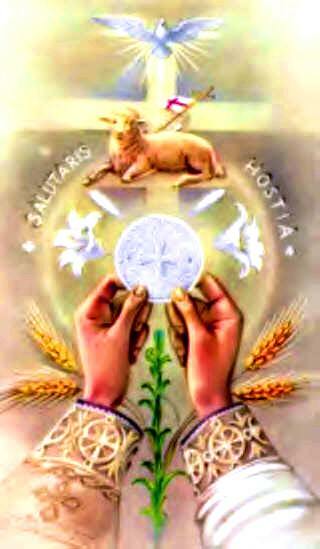 The devil hates the Eucharist, and is trying to desecrate it and degrade it every chance he gets. Just look at every country that has been taken over by evil atheist governments - one of the first things they do is kill priests and shut down churches. This happened in Nazi Germany, France during the Revolution, and in the Soviet Union. By adoring the Eucharist, and by consuming the Eucharist, we are following God’s instructions and helping Jesus to “destroy the works of the devil” (1 John 3:8). Remember - The Bible says that the devil goes around like a roaring lion trying to devour us. Evidently the devil wants us damned, so we can be his food, and spend our eternity in hell with him. 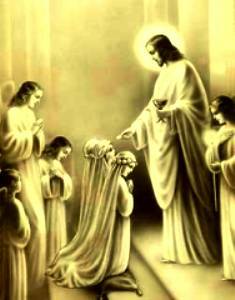 Jesus, on the other hand, wants to be our food, so we can be blessed and attain eternal life with Him in Heaven. Consuming the Eucharist, the fruit of the tree known as the cross, or the Tree of Life, overcomes Adam eating the forbidden fruit from the tree known as the Tree of Knowledge of Good and Evil. Remember, a prayer said from the heart immediately after receiving Holy Communion is very powerful, because you and Jesus are one flesh at that time, so please don't take the time lightly after you receive Jesus in the Eucharist. And always remember to first seek the love of Christ, before asking for something. And never forget that the Eucharist overcomes the 2 lies of satan told to Adam and Eve- "You will not die!" He said. Jesus says if we eat his flesh and drink His blood we will have life everlasting! "You shall be as gods," said satan. Jesus says that if you eat the Eucharist, He abides in you, and we in Him!